The 11th National Games were held in Jinan, Shandong province, and the Games have been hit by scandals, such as pre-decided gold medals, doping, match-fixing, unfair officiating, and so on. The intention of the National Games is picking talented athletes for the Olympic Games, but the scale and cost of the National Games has grown significantly since the Games started 50 years ago. The National Games has become the “Authorities’ Pride Games” of the different provinces and sports associations, and also important to officials looking to not lose face for their respective areas. In this year’s National Games' Men’s 10m Platform competition, Zhou Luxin/Wang Jiankai had a more remarkable performance, but they were beaten by Lin Yue/Cao Yuan and got second place. The audience hissed its displeasure in the venue. The picture shows Lin Yue / Cao Yuan in the competition. In the National Games News Conference, a reporter asked Zhou Jihong a question about the "gold medal pre-decision" issue. Unexpectedly, Zhou answered with a question with her own: "Which work unit are you from?" The reporter responded with his question again, and Zhou asked the reporter once again: "Which work unit are you from?" As a result, the quote "Which work unit are you from?” became very famous on the Internet. In 1984, Zhou Jihong won the Women's Platform Diving champion in the Los Angeles Olympic Games. This Picture was taken after Zhou won the game. In the finals of Women's Singles Trampoline, He Wenna, the champion of Beijing Olympics, was only fifth place. A lot of famous athletes and teams withdrawing from the competition is one of the stranger occurrences of this year’s National Games. For example, Guo Jingjing originally entered four events, but, in the end, only competed in the Women’s 3m Springboard. Lin Zhang, who is called “Liu Xiang of the Water”, said he would try his best to enter every event on the night of October 19. Instead, he quit the Men’s 100m Freestyle competition the next morning. His stated reason was “to preserve his strength for the relay”. The He’nan rowing team withdrew from competition due to a positive urine test. More than 30 athletes’ four years of preparation was totally wasted. In addition, Chen Fei, Tong Wen, and Chen Xiexia also withdrew because of injury. Similarly, there was an incident four years ago at the Nanjing National Games. Sun Fuming pretended to fall down and lose her judo match. Before Sun Fuming fell down, she looked back to her coach Liu Yongfu. That look revealed the lie in her defeat. As Guo Jingjing quit the women's three-meter doubles, "always second place" Wu Minxia finally won gold in the event, her first gold medal in this year's National Games. Lin Zhang said he would try his best to enter every event on the night of October 19. Instead, he quit the Men’s 100m Freestyle competition the next morning. His stated reason was “to preserve his strength for the relay”. The pictures shows he was waving hands after he won the Men's 200m Freestyle competition on October 19. The Henan rowing team withdrew from competition due to a positive urine test. More than 30 athletes’ four years of preparation was totally wasted. The picture shows Guo Linna (second from left) won the World Cup in Munich races. Four years ago, with a loud shout from judo coach Liu Yongfu, Olympic champion Sun Fuming (white) took a few steps back, Yan Ruisi (blue) gave Sun a push, and then the Olympic champion fell to the ground. There have also been problems between athletes and referees. In the Men’s Judo 66 kg Group B match, Ren Jiawen (of Shandong province, where the Games are being held) completely ignored the referee’s order to leave, instead standing in the venue for 8 minutes. The Shandong cheerleaders shouted “black whistle”. In the Women’s Track Cycling Points race, nine Beijing athletes were a lap back throughout the race, but the nine athletes did not obey the rules to leave the track and kept racing. The chief referee had to fire his gun and pause the race. Not only were the nine athletes removed, but also the other Beijing athletes were not allowed to continue. The decision led to significant complaints from the Beijing team, but the Deputy Secretary-General of the Chinese Cycling Association, Han Jiling, claimed that there was no problem with the referee’s decision. Ren Jiawen completely ignored the referee’s order to leave, standing in the venue for 8 minutes. Ren Wenjia had physical altercations with the staff. Ren Wenjia roared angrily. Ren flung off his coat, and then left. On July 26, during the National Games' Men's Football Group A final round, Beijing beat Tianjin 3-1. The Tianjin team members vented their anger to the chief referee, He Zhibiao. A number of players chased the referee for 150 meters, kicked the referee, and did other ridiculous things. The 11th National Games is being held in Jinan, Shandong. From the opening ceremony to the venue construction, the quality has been at least comparable to the Olympics, if not better. 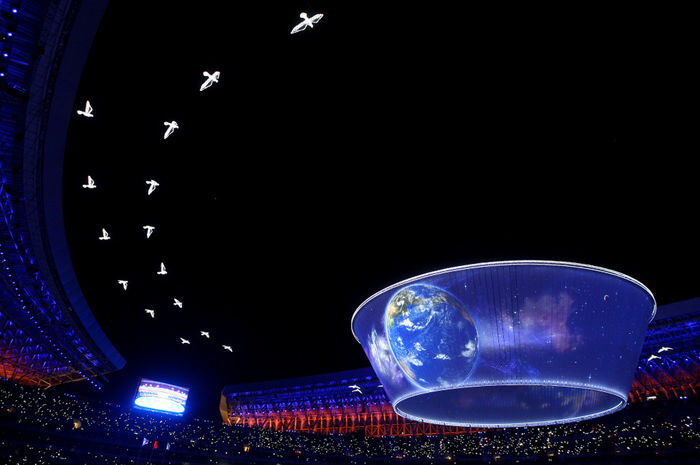 The opening ceremony created a number of the world firsts: the use of 20,000 square meters of 360-degree projection. The venue construction is the best for any National Games in history. 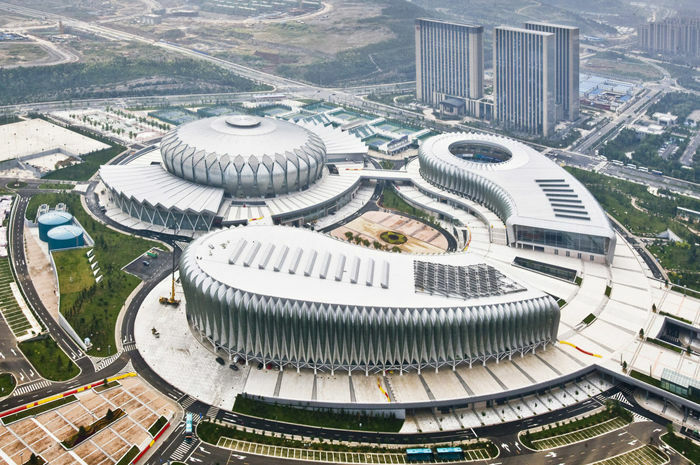 The tennis courts, which are at the Jinan Olympic Sports Center, cost almost 300 million RMB, accommodate nearly 4,000 spectators, and have 99 toilets. Nearly 400 million RMB was invested in the water sports complex. The pool water is “clean enough to be drinkable”. In order to host the National Games, Shandong province built a total of 44 new venues and renovated 85 venues. If added to the city and transportation infrastructure investments, the total investment is close to 200 billion RMB, equal to the sum of 2 years of tax receipts for all of Shandong province. From the opening ceremony to the venue construction, the quality has been at least comparable to the Olympics, if not better. These photos show the opening ceremony. Shandong Province, in order to host these Games, constructed a total of 44 new venues, renovated 85 venues, and if including city and transportation infrastructure, the province's total investment is close to 2000 billion yuan, equivalent to the sum of the province's land tax for two years. Wei Jizhong said once the National Games are abolished, the whole nation system in the sports industry would not be feasible. After 11 occurrences, the National Games seem more like a vanity fair. Some provinces spend hundreds of thousands of RMB in prize money to encourage players. Outside of the Games, the provincial sports bureaus also compete behind the curtain. As a public institution, to win gold and silver medals, and to gain points in the National Games is a chief measure of their work. The National Games are the most significant metric for sports bureau workers, and greatly effect their future prospects. In addition, the pre-decision of gold medals, corrupt referees, and athletes’ abnormal quitting reflect the fact that even in many areas where China succeeds, such as diving, the administrators are both concerned with the business aspects as well as the actual sport. Altogether, these have caused a potential threat to the fairness of the National Games. Originally, the National Games were just held in Guangdong, Beijing and Shanghai and regarded as a financial burden. Now, from the coast to the inland provinces, there is an intense competition for the right to host the Games. The reason is, a city’s infrastructure gets a significant upgrade by holding the National Games. A large number of urban development and transport projects, which would normally be slow to approved, were quickly put into operation and received large bank loans. For example, before the 10th National Games, Nanjing built its first subway line. The National Games in Jinan have also led to a large number of overpasses and rapid transit systems being built. According to media reports, Zhejiang, Tianjin, Hubei and Sichuan, also announced a desire to host the next Games. In Hu’nan, the government said they would come up with 200 billion RMB to make their bid more attractive. Russian sports have gradually abandoned the "whole nation model." Their football league is the most important event after the five major leagues in Europe. The photo shows the Russian team that won the super-Zenit 2008 UEFA Cup. The National Games are a show for the provincial governments, a display of officials’ performance, and an opportunity to gain face. The ultimate cause is the “whole nation” system. In this system, our sports development is “gold-oriented” and “all for the gold medals,” with the number of gold medals seen as representative of Chinese national strength and ability. This has exacerbated the utilitarian overtones of the Games. In fact, the Games have also contributed to the “whole nation” system in sports. After the first National Games, every province and municipality established professional teams and focused on different sports. In 1979, China resumed its seat on the International Olympic Committee. The National Games projects are basically in line with the Olympic sports. The gold medals are the only metric that matters in the Olympics. The selection of back-ups for the Olympic Games involves many local teams’ interests. Since each province wants to have more Olympic athletes from their own teams, the competition among the local teams seems unavoidable. Wei Jizhong, the former vice chairman of the Chinese Olympic Committee, stated that once the National Games are abolished, the “whole nation” system in the sports industry would not be feasible. After 31 years of the reform and opening policy, sport is still one of the areas controlled by the government. In fact, Russian and the Eastern European countries have already abandoned the strategy of using “the power of the whole country” for Olympic gold medals, and have introduced market mechanisms to support the sports industry. However, the Chinese National Games are still set in the old ways. As long as the “whole nation” system is not changed, the National Games will still be dubbed “the money, authority and stimulant Games”. Actually the National Games didn’t go bad. The difference is just that people said the problems out loud. Funny things happen all the time, but there are just too many recently. The boring National Games. The Games would be interesting only if the famous players didn’t join the Games. The Games truly stink, and it is a big stink! I watched the opening ceremony, and I think it is too wasteful. Why should we compare the construction of the National Games with the Olympics? The revitalization of the Chinese nation and China’s pride are the reason why we worked so hard for the Olympic Games. The huge investment for the National Games will only increase the burden on the people. The National Games are extravagant and wasteful. It would be much better if the money is invested on education and poverty alleviation. Everything could be fake in China, even sports. I can’t believe it. The National Games are the true microcosm of the whole society. I’ve never watched one game.